The Breitling company was established in 1884, deep in the Jura Mountains of Switzerland. Initially, their specialty was making chronographs and precision counters for scientific and industrial purposes. In 1892, the company relocated to La Chaux-de-fonds - the heart of Swiss watchmaking - and not long after emerged as an innovator in the nacent international watchmaking industry. As a leader in chronographic equipment and technology, it was natural that Breitling's eventual foray into watchmaking would become closely linked with the (then) developing aviation industry. Today, the company's timepieces are symbolic of navigation and adventure. * Gaston Breitling created the first wristwatch chronograph in 1915. * The company became the official supplier to the Royal Air Force in 1936. * The company's Navitimer, created in 1956, is often called a navigation computer and is capable of handling all the calculations called for by a flight plan. Navitimer: Olympus This powerful chronographic watch symbolizes the company's image as the navigator's trusted companion. It has been the official watch of the Aircraft Owners and Pilots Association since 1952. The Olympus has a mechanism composed of 250 pieces, allowing measurement of short times while displaying the date, day, month, and moon phases. The innovative chronometer-certified caliber 19 needs adjustment only during leap year. This watch comes in steel, steel/gold, yellow gold, and white gold version. Chronomat: Evolution The Evolution is one of the most popular versions of the Chronomat model. It has sophisticated lines in a precise and functional chronograph. The case is fitted with screw-locked safety pushpieces, allowing this timepiece to tolerate overpressure of 30 bars or 1000 ft in depth. The case is steel and the band is black crocodile leather. AeroMarine: Super Avenger With a name like Super Avenger, this is a powerful, yet elegant, timepiece. 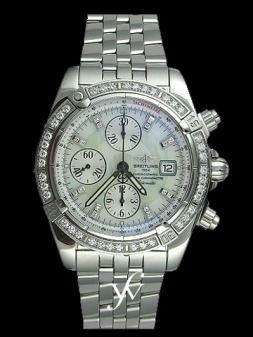 The chronograph uses a sturdy caliber 13, the most superior movements developed by Breitling. It is designed to withstand a pressure of 30 bars and has a large sized dial and hands to optimize readability under all conditions. The black dial is set off by the stainless steel professional bracelet.